Edit: OH MY GOD. I GOT MY FIRST DAILY DEVIATION?!?! I never thought I would get one, I'm shaking right now! Thank you! Th-thank you so much iingo SilverChaim and TheCreativeJenn! 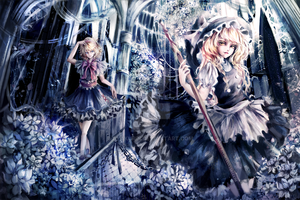 SilverChaim says, "All the colors, details and light make this Touhou fan art so awesome and beautiful." A few years back, I suppose? I really liked your art in its simplicity and innocence. BEautiful! Love the pose, the hair, the background, everything! This is absolutely stunning, you deserve that DD, congratulations dear! Ahaha thank you very much! Yeah, it's cool to get a recognition for something you worked hard on, and this is really nice. The subdued green and different shade of subdued red is pretty. I like those two colors too. ^.^ Congrats! You deserve every minute of that euphoric feeling. This REALLY deserves a DD! Congratulations! You're Welcome! Keep up the Work! Wow, I'm amazing at how many colors there are! Great work! Why is her hair gold? Wow! This is amazing! As are all your drawings!! Keep up the amazing work! !